No, I didn't cut my hair or get a new shirt, but thanks for the compliment on both of those things! But I did change up the blog a little bit (again). Did you notice that? I've been thinking of changing my blog name for a few months now but was never quite sure what it would be. All I knew is that I wanted the blog name to be a verse, like some of my best blogging friends' blogs are. After numerous prayers, devotions, and journaling, I found myself clinging to the phrase "in its time," which comes from a verse in Ecclesiastes. And the more I prayed over it, the more excited I got over this new blog name. The verse begins with "He has made everything beautiful in its time," the exact words I need to remind myself of each and every day. And what better way to remind myself than to name my blog after it? In its time is a personal reminder of just how perfect His timing is for me. I've mentioned it before and will never get tired of writing just how amazing His timing is. Whether it be a song played on Pandora, a verse found during devotions, or just a text from a friend at just the right moment, His timing is perfect. And that's something I want others to know, too. In its time is also a reminder that every thing will be and is beautiful. My story and faith in Him didn't start out as something beautiful. If anything, it was the exact opposite. It was a life full of sin and ugliness. But slowly and surely, I found myself clinging to Him instead of worry and fear, and since then I have discovered all of the beauty that is in and around me. That said, beauty takes time and it's in His timing, that true beauty shines. Lastly, in its time reminds me that not everything happens immediately. I may set up deadlines, but in the end, His plans for me will always prevail. Reminding myself of this truth not only helps strengthen my patience and endurance but provides me with a source of hope, knowing that everything takes time and everyone's stories are different because of His timing. p.s. If we've swapped buttons, I made some new ones for you to check out! There's no rush and no worries if you don't feel like changing it because I'm keeping my blog's URL the same (at least for right now). I love this new name! God has really been giving me a wake up call lately with being patient! He has opened my eyes completely to How much He cares about every detail of my life, even when things don't go my way. I have a problem with wanting a yes or no answer right away, and God is weaning me out of this habit. haha. Control freak problems, you know! Love this! What an awesome name sweet girl! Love the design! Yup, I love it. Perfect! 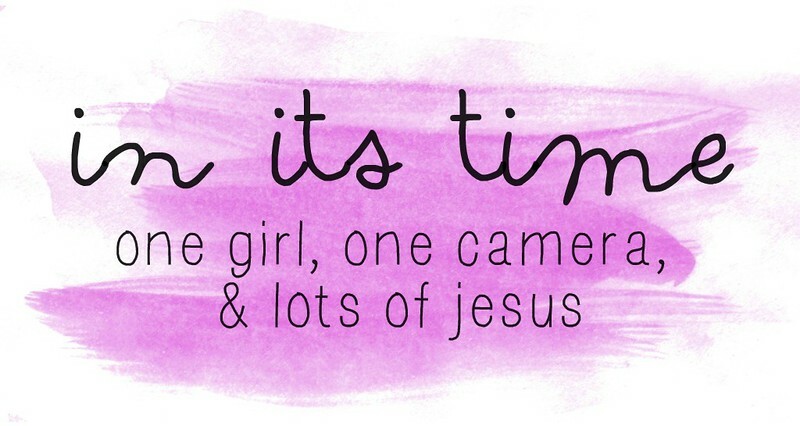 And I love the design and your little slogan "one girl, one camera, and lots of Jesus". So glad you finally did this friend! The name has so much wonderful meaning of how good our God is behind it! And I'm soooo glad I finally changed it. It's a little weird because I feel like I have an entirely new blog now! Ummm, I'm in love with this! I think it is awesome and fits you so well! However, I wish it didn't make me want to change my blog name again....argh I'm so indecisive about everything haha! Ummm, I'm so glad you're in love with it! And I love that you think that it fits me. I was worried it wouldn't come across as such. And girl, you can totally change your blog name if you feel like it! Changing my blog name and design was really like a breath of fresh air and I think it's really re-energized my blogging, too! But I know how you feel, I'm so incredibly indecisive as well! Oh girl, I'm a little sad about leaving Paint Chip Madness behind, too! It's definitely an odd (yet refreshing) feeling to have a new blog name and everything but it's a good one, too. But that doesn't mean this change isn't bittersweet! Pretty new look! :) And a very meaningful name. :) I like it! Thank you, thank you! It's definitely meaningful and something I'm glad I finally did. :) And congrats to you for finishing the entire Blog Every Day in May challenge!! It definitely wasn't easy but it's an challenge I'm proud of achieving! Really like the new look! And the new blog name! I am jealous of all the people who can change their blogger templates so easily, I wish I was just slightly better at it. I am just getting all the buttons linking stuff down. i LOVE this!!! and the name! And that verse is definitely one of my top faves, too. So many good messages in that one little verse. I love that verse! He has (and is) making everything beautiful in it's time! What an encouraging title! Thanks, Taylor! I'm so glad you stopped by my blog! And that verse is amazing, right? It's one of my faves and I love how there are so many messages in it that remind me of God's goodness and my need for trust and patience. Seriously, love the name, love the meaning, love the layout. I haven't check out your blog since the last Girl Behind the Blog Linkup, but I out-of-the-blue found it again today! I love your new blog design, the new name of it, and the meaning behind it. Thanks for sharing you heart! I love hearing about what God is doing your life! Thank you, Kasey! I'm still really loving my blog name and am so grateful that it not only fits my life right now but that it will fit in the times to come. Hi Jennifer! Thank you! Our God is definitely a great, great God. And I am so glad that it could be of encouragement to you! That was my goal and I love that it not only applies to me, but to everyone else as well. I really like your blog name. And that verse :) good choice!